One of the last parts to be assembled is the frame. It is normally made of aluminum and has the function to ensure robustness and a practical and safe coupling to the photovoltaic module. Together with the frame, also a layer of sealant is deposited around the walls of the panel as a moisture barrier. For this purpose the most widely used material is silicon, although sometimes a special sealing tape is used. The junction box has the function of bringing the electrical connections of the PV module outside. It contains the protection diodes for shadows and the cables for the connection of the panels in the field. In choosing the Junction box we pay attention to the quality of plastic, the goodness of sealing, the type of connection of the ribbon and the quality of by-pass diodes. The front glass is the heaviest part of the photovoltaic module and it has the function of protecting and ensuring robustness to the entire photovoltaic module, maintaining a high transparency. Interconnect ribbon is a hot dip tinned copper conductor installed in photovoltaic/solar panels. The interconnect ribbon is soldered directly onto silicon crystal to interconnect solar cells in a solar panel. The interconnect ribbon carries the current generated in solar cells to the PV bus bar. The term backsheet literally means the sheet on the back. It is made from a plastic material that has the function to electrically isolate, protect and shield the PV cells from weather and moisture. This particular sheet is usually white in color and is sold in rolls or sheets. There are particular versions that can be different in thickness, in color and in the presence of particular materials for a greater shielding or for a higher mechanical strength. 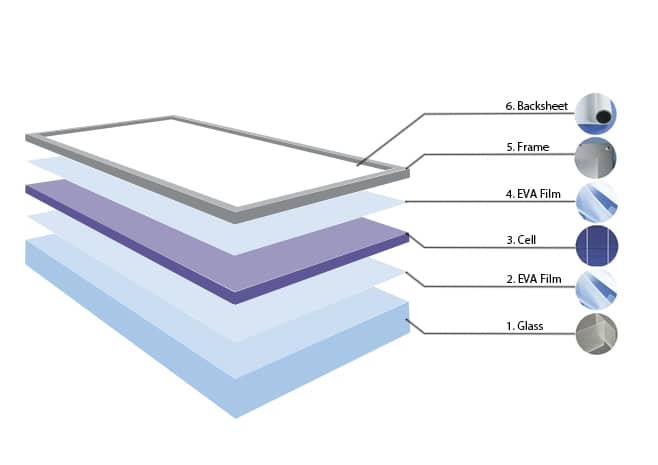 One of the most important materials is the encapsulant, which acts as a binder between the various layers of the PV panel. The most common material used as an encapsulant is EVA – Ethylene vinyl acetate. It is a translucent polymer sold in a roll. It must be cut in sheets and deposited before and after the photovoltaic cells. When subjected to a thermal process of vacuum cooking, this particular polymer becomes similar to a transparent gel and incorporates the photovoltaic cells. KRD Global Group is Coveme’s official distributor in Eastern and Northern Europe. For the photovoltaic industry Coveme produces sophisticated multilayer laminates, so-called backsheets. They function as electrical insulator and protect the solar cells from humidity and harsh environments. KRD Global Group is Sunter’s official distributor in Eastern and Northern European Market. Sunter is a leading National High-Tech Enterprise specialized in research, development & sales of solar PV junction boxes, connectors and cables.